Since the end of 2014, inflation has been at or very close to zero. With very little ability to move the actual interest rate further into negative territory, the ECB has resorted to unconventional measures. The latest of these includes a programme to purchase corporate bonds, which started on 8 June 2016. 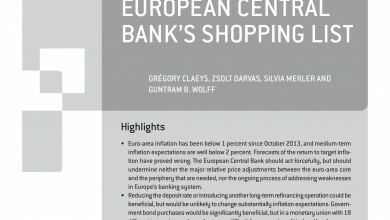 The general macroeconomic situation and weak inflation dynamics justified quantitative easing (QE) in the euro area. Doubts have emerged about its effectiveness as inflation has remained weak. However, we do not know where inflation would have been without QE and the still large slack in the economy suggests that inflation might increase only in a few years. Two major channels through which QE operates are visible: a weaker exchange rate and lower long-term yields. Lending, investment and housing have somewhat increased. However, banks have not shed sovereign debt from their balance sheets at a significant scale. Bank profitability is squeezed by QE but we do not see a generalised financial stability risk as credit creation remains meager. Further monetary policy action is unlikely to generate strong benefits. It is important that other government action supports the ECB in achieving its goals.